Good afternoon class, I�ve got a bit of a surprise for you today. This installment of �Magnet School will serve as your �free elective�, an opportunity to celebrate the puzzle genre�s incredible variety: here you will find perhaps the most singularly unique games we�ll ever cover. Not only are these three almost totally unlike each other, but they have few peers anywhere in the medium: exciting, huh? Of course, to the untrained internet eye it might look like this class is just a dumping ground for random stuff that wouldn�t fit anywhere else, but I (and the �Magnet School legal team) maintain that this is TOTALLY not the case. *ahem*�anyway, let�s get down to business. What Is It? � Allow me to introduce a little company called G. Revolution, or G. Rev for short � readers up on the shooter scene might know this group of former Taito employees from their supporting roles, such as lending Treasure some development help on Gradius V and Ikaruga. They�ve also produced several original shmups, such as Border Down and the hybrid Senko no Ronde series, under their own banner. In its earliest days, though, G. Rev needed to quickly build both name recognition and capital to survive: their best option was a relatively simple game with wide appeal and a relatively low cost overhead (in otherwords, a puzzler). The rest is history, and in 2001 G. Rev�s very first title hit the market � its official page is still up too, if you�d like a look around there. How Does It Work? � While some cynical passers-by will glibly label Star Seeker a �tarted-up Minesweeper clone�, such an undercooked blurb doesn�t begin to do it justice � this is not a game intended to merely gauge luck and kill time. 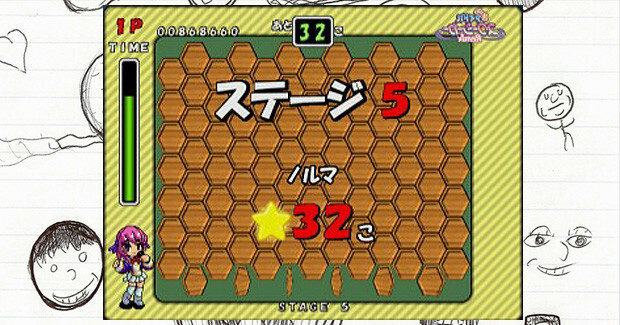 Yes, each level consists of a grid of hexagons (tiles), some of which are concealing stars (mines), and your goal is to figure out exactly where they are, using some handy numbers and the process of elimination: past that point, this is a totally different animal (seriously, keep reading). For starters, instead of clicking around with a mouse, you�ll use a specialized cursor to get the job done: it consists of a �primary� central hexagon (outlined in red) surrounded on all sides by six �helper� hexagons (outlined in yellow). As you move it around the board, you�ll notice a number floating above, which tells you how many stars are hidden beneath the seven tiles the cursor is currently highlighting. If this number is �1� or higher (i.e, there�s at least one star within the cursor�s area), pressing the �A� button will turn over the single panel beneath the �primary� hexagon, but if the number is �0� (i.e., no stars are nearby) the cursor will flash, and hitting �A� will instantly clear away all 7 highlighted areas, helping to narrow down the search much more quickly. A handy feature, especially since you�ll need every spare second you can get � yeah, did I forget to mention that every puzzle here has a VERY strict time limit attached to it? I can�t stress enough that Star Seeker is NOT a leisurely sort of experience: if you want to keep playing, you need to make things happen PDQ. By the way, I ought to clarify that your objective here, once you�ve discovered where the stars are hiding, is to reveal them, rather than avoid them. This must be done in a specific fashion � when the center of your cursor is over a spot where a star is concealed, pressing the �B� button will place a flag marker there. Only then will uncovering the star count as a point in your favor (and add an extra second or two to the clock): revealing a star without marking it first will 1) Negate its point and timer value, and 2) Re-conceal opened spaces (including stars) in the area, forcing you to repeat previous work, which you really can�t afford to do. It might sound like one or two mistakes (since accidentally marking and uncovering a blank space will obviously hurt too) could spell instant doom, and this might be true - IF you didn�t have a trick or two up your sleeve. For starters, if you�re not on the brink of defeat, once you�ve found a star, mark it, but DON�T uncover it. Do this to a couple of them in a row, and when you eventually reveal a star all the others you�ve flagged will instantly surface, with their score values and time bonuses multiplied � work really quickly and you can even �speed chain� by bringing up another star in the middle of the sequence. While �chaining� is the most crucial single technique to learn, there are a handful of other perks for players to take advantage of - for a more detailed look at them feel free to download the first issue of the �Gamer�s Quarter� newsletter. The Star Seeker piece in there was written by a fellow shmups.com forum denizen who�s a stickler for details, so give it a read. Why Should I Play It? � If it�s okay with you, I need to get something out of the way before going further. 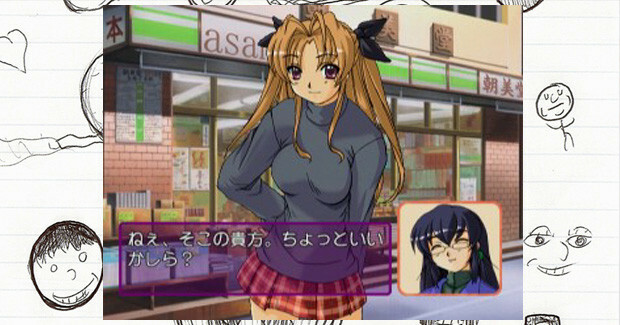 I�m sure that this game�s title was enough to set some Japanese-literate readers on edge; �doki�, the word for the sound of one�s heartbeat, is commonly evoked for �romance� titles, and �idols� are pretty-girl models with often-questionable talents in other areas, so if you suspected that Star Seeker was aimed squarely at the �so ronery� crowd I can�t blame you, since to a point you�d be correct. 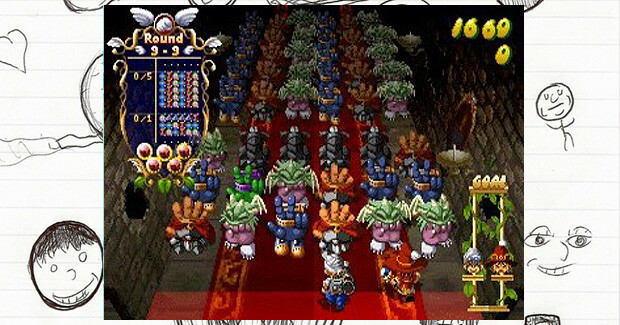 The story and setting do revolve around a (fictional, obviously) group of up-and-coming �idols�: finishing a level in the game�s primary mode reveals a picture of them, somewhat reminiscent of the legions of �adult�-themed Qix clones you scroll past while browsing through any MAME directory. Trust me, though, when I tell you that Star Seeker is nowhere near that sleazy � yes, there�s some fan service here, but it never gets much worse than a handful of swimsuit shots, and doesn�t even go that far very often (in any event, the artwork�s inherent quality is nothing worth getting excited about to begin with). 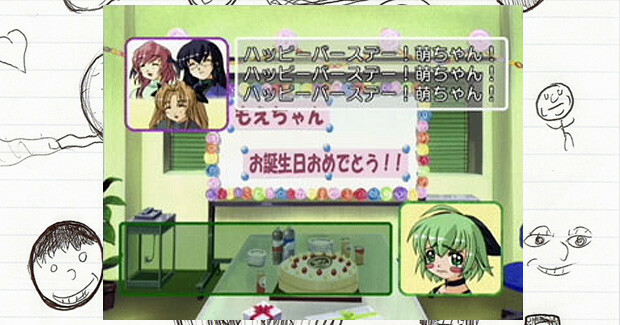 By the way, if you play �Remix� mode instead, the girls are replaced with generic pictures of flowers and landscapes, so the �idol� theme can be almost totally avoided if it turns you off that much. Okay � now let�s delve deeper into Star Seeker�s unique alterations of and improvements upon the basic Minesweeper formula. Right off the bat, attaching crucial guiding numbers to a movable cursor (rather than stationary uncovered tiles) presents players with a much greater degree of accuracy during searches: no more �insta-mines� on the first click so long as you�re careful. While the freebie on your computer comes equipped with a �passive� timer, the need to work quickly is obviously much more pronounced here, since missing a deadline equals Game Over � fingers fly and minds race during the rush to sniff out those last few stars. Keeping cool under such tight circumstances can be very difficult; leaving �marked� stars underground makes doing the mental math tougher, but getting anywhere in Star Seeker requires tracking and �chaining� several hidden finds at once, especially in star-packed levels where more complex deduction is needed and individual reveals count for very little. It is tricky, but practice makes perfect � if things get a little too hard, you can recruit a second player and work cooperatively (no �versus� mode though). To be perfectly honest, when I first heard of this game I didn�t think it sounded like anything special, but as you can see a bit of quality star-seeking time has changed the situation; something tells me that the same would apply to a lot of you out there. Where Can I Find It? 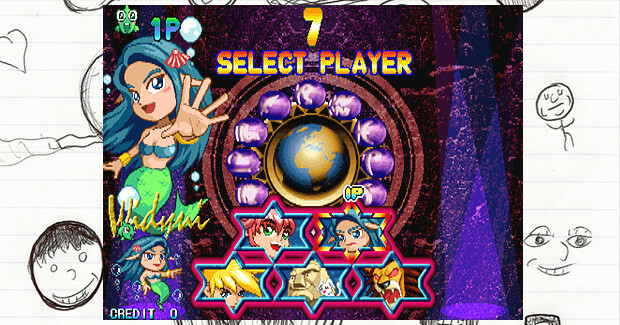 � The original arcade release of Star Seeker, on Sega�s Naomi board, isn�t often spotted in the wild, and to the best of my knowledge has not yet been emulated � the best option available to most players is the Dreamcast port, Doki Doki Idol Star Seeker Remix. This version, however, isn�t a particularly easy find either, as its print run was relatively low and its price rarely dips below the original retail point � not to mention, of course, that it never left Japan. If you do manage to snag a copy it plays nicely and adds a few extras, most notably a �story� mode with full voice acting (if you�re into that kind of thing, anyway). 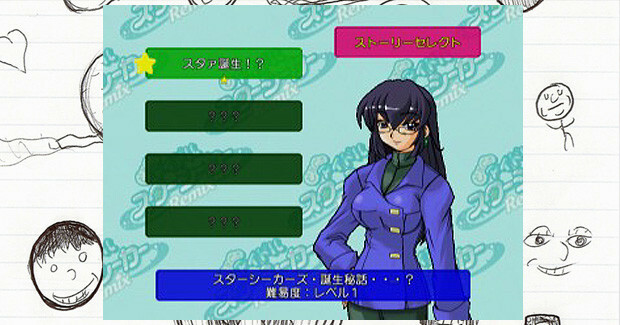 More recently a stripped-down version of Star Seeker was made available for Japanese cell phones, though I doubt that very many readers have any sort of access to it. Anything Else? � Perhaps someone better acquainted with the homebrew scene than I am could present evidence to the contrary, but I�m not aware of many notable Minesweeper offshoots apart from Star Seeker � one nifty (and free) offering that I did manage to stumble across is Acidbomb (which I�ve also seen called Shellblast), in which you quite literally sweep up to 3 sensory lines (horizontal, vertical, and diagonal) across a tile formation in order to narrow down where the explosive triggers are hidden. As with Star Seeker you�re racing the clock, and also have viruses and other hindrances to deal with along the way � thankfully, some stages supply a couple of �instant reveal� items to help you along. It might not be quite as epic as Minesweeper: The Movie, but then, few things are. What Is It? � While most of the puzzlers we�ve discussed are Japanese in origin, for this lesson we�ll be taking a trip to Taiwan, home of long-time industry presence International Games System (better known as IGS). 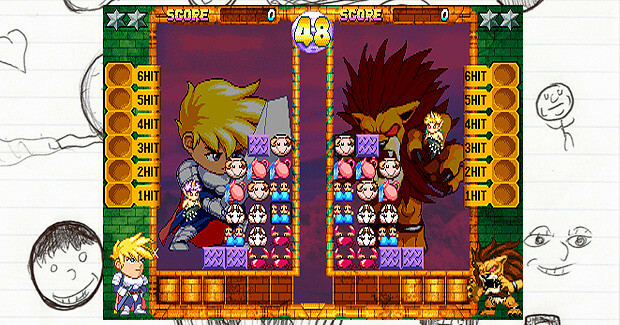 While scrolling beat-em-ups like Knights of Valor and Oriental Legend are probably their most recognizable assets, in the year 2000 they made a rare contribution to the puzzle end of things, via their signature Polygame Master (PGM) arcade board. 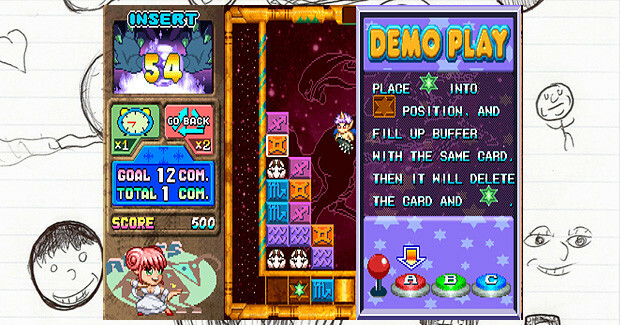 It should be noted that there are several games called �Puzzle Star� floating around out there, and moreover that very few of them are worth playing: it figures that you�ll probably have the hardest time tracking down info for this one worthwhile title, as few sources seem aware of its existence. How Does It Work? � When you start up a game of Puzzle Star, you�re faced with a few rows of various blocks stacked on top of each other; beneath them is an empty �buffer� zone large enough to fit 3 (or more, as you progress further) of these blocks into. 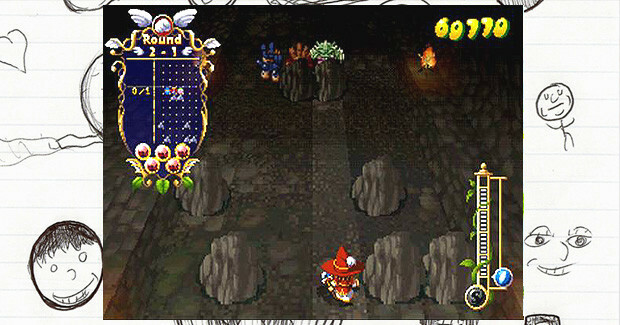 Your goal is to fill up this zone with identical pieces to make them disappear, one complete set at a time, until the screen is empty � the catch is, you can only transfer blocks positioned on the far left end of each row into the buffer, and any mismatched groups will reappear at the bottom of the field. To further complicate things, you�ll also spot a few stray star-shaped pieces scattered about the field, which will grant you a small bonus when cleared � unfortunately, there are never enough of them around to max out the buffer and vanish in one shot. To get around this, the buffer always contains at least one star-shaped space, into which one star at a time must be placed precisely, and then �covered over� by a complete set of �normal� pieces - basically, stars must be �worked into� matching groups of other blocks and �snuck out� along with them. As per usual it�s not nearly as complex as I�m making it sound; the embedded video should do a better job than me of making the concept clear. Anyway, you�ve got two caveats to avoid as you attempt to sort all of this out � 1) Stacking too many rows too high (by making too many incomplete sets) will end your game instantly, and 2) So will taking too long to solve a level and running out the timer. Fortunately, you�ve got limited use of two different instant-effect items to help you in a pinch, and can earn more of each along the way � the first one adds a few extra seconds to the clock, and the second allows you to take back a botched move. You�ll quickly find that both come in VERY handy. Why Should I Play It? 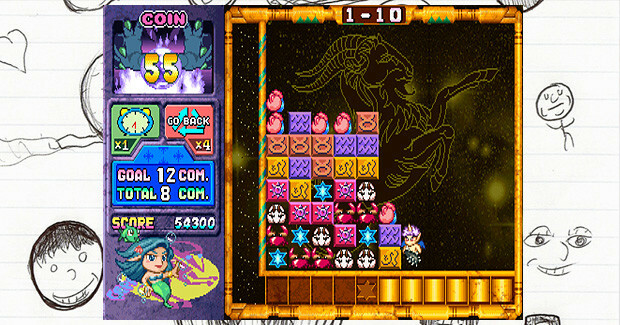 � At its core, Puzzle Star is actually a pretty simple game � not a huge surprise, since it�s based on a much older title (more on that later), but the designers skillfully avoid allowing their product to feel dated, making wise concessions to the player and working in some depth without over-complicating things. Your key to success, to put it plainly, is thinking ahead � most levels won�t offer you enough correctly-positioned pieces to form full sets at the start, so you must purposely construct �incomplete� formations in order to bring them back onscreen in better spots. You have to be quick in picking out which reconfiguration would be ideal to aim for first: treading water and shuffling things around more than you need to will waste precious seconds, and opportunities to make up for them are fleeting. Going the extra mile and planning several moves in advance places additional rewards on the table: if you can put together two or more matching sets in a row quickly enough (which is impossible unless you set the pieces up right), it counts as a �combo� and you�re awarded extra points, plus eventual opportunities to skip stages and get additional items. Tack onto this the extremely welcome capacity to add a little extra breathing room to tough puzzles, not to mention correct some otherwise-frustrating mistakes, complemented with a modest but charming presentation (watch the enemy witch freak out whenever you make a match, or the mermaid cheerfully take a snack break after completing a puzzle) and you�d be amazed at how engrossing such a bare-bones concept can be. On the downside there�s no one-player �Versus� mode against the computer, but grab a pal and the two of you can face off directly to see who blinks first. Where Can I Find It? � Yup, we�ve got another arcade exclusive on our hands � Puzzle Star never made it to any home system, so your only chance of playing it rests on tracking down a PCB or (more likely) emulating it. The latter setup plays fine, though as you can tell from the video the sound hasn�t been perfected yet. Anything Else? � Remember the �much older title� referenced above, which directly inspired Puzzle Star? The game I�m talking about is Dharma Doujou (sometimes called Daruma Doujou) � anything in that linked video look familiar? 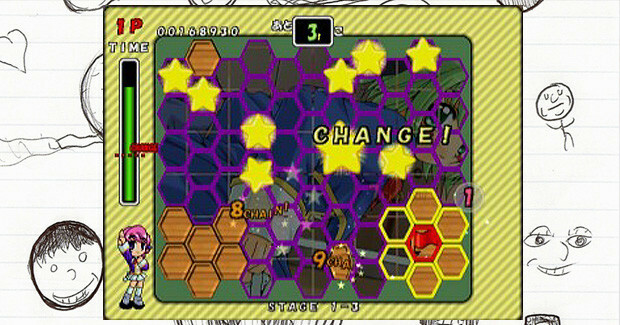 Yup, the �knock stuff off the left side to make sets� mechanic originated here (to the best of my knowledge, anyway), and while combos, special items and other bells and whistles haven�t been implemented yet, Doujou is still a good bet for anyone who enjoys what Puzzle Star has to offer. For players looking to broaden their scope a bit more, something like Sanrio Carnival 2 or Guts�n (start the video at about 4:15) might be up your alley � even farther out there is Eolith�s kooky Puzzle King: Dance and Puzzle, which plays VERY differently (you can�t place and match stuff at the same time, but have to switch back and forth between separate �modes� for each), though it still relies on players making use of specific �exposed� pieces to put sets together. What Is It? - Affect is another longtime Japanese developer with very little presence on this side of the world: only a handful of their games, such as Kendo Rage and Phix, ever left Japan, and none of them were exactly huge hits. Then there�s this 1999 puzzle hybrid, which takes an exceedingly novel approach to a familiar subject: believe it or not, Affect�s official site still has a section devoted to it, via which you can at least add a new sprite-based GIF or two to your collection (which will likely inspire many a �where is that from?� once anyone else notices). How Does It Work? � Finger Flashing is a puzzle shooter, but it�s almost nothing like Twinkle Star Sprites or Calcolo. 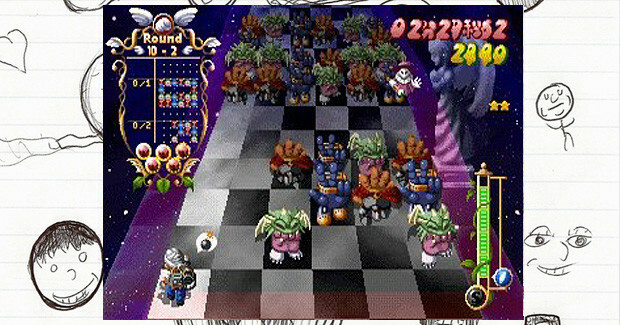 At the bottom of the screen is your character, who can be moved left or right, but not up or down; at the top are your enemies. Both you and the bad guys (who are also displayed on a �mini-map� in the upper corner) automatically walk towards one another at a steady pace, and if a single one of them manages to get past you the game is over � your task is to pick everybody else off before that happens. How to do that? Well, you might have noticed that every monster in the game bears a resemblance to a human hand posed in one of three ways: a closed fist, an open palm, or a two-finger �V�. Sound familiar? That�s right, it�s the age-old game of �rock, paper, scissors� - conveniently enough, you�ve got three types of �finger-based� attacks (mapped to three different buttons) perfect for the occasion. Shoot a �paper� monster with a �scissors� shot, for instance, and he�ll disappear � if you screw up and hit someone with an incorrect attack, though, a new baddie will pop up there for you to deal with. Things start off relaxingly enough, but there are two ways to speed things up � first, the optional, �good� way to do it. At any time during gameplay you can toggle how fast your character walks towards the enemy, between five settings: while sticking to a slow speed is obviously easier, successfully dispatching enemies at a sprint yields far more points, so once you�ve got your bearings you�ll want to mosey on through each level as quick as you can. Careful, though, as there�s also a �bad� way to crank up the velocity, by causing the bad guys to gain some extra spring in their step. Every time an enemy formation shows up, it�s accompanied by a number, which acts like �par� on a golf hole. If you have to use more shots than that to vanquish an approaching wave, the next group will bear down on you more rapidly, and if you take too long to defeat THEM it gets faster still � on and on it goes until you simply can�t handle it, and there�s no point bonus attached here either. Staying under �par� will gradually slow things back down, but since the shot limit for most enemy groups is no more than one or two, the game�s standards might seem impossible to meet�until you get the hang of chain reactions, that is. As an example, find a �rock� enemy which has a �scissors� monster right next to it, in any (non-diagonal) direction. Fire a �paper� shot at the former to get rid of him, then watch what happens: as the �rock� baddie disappears, it will subsequently �beat� any �scissors� enemies in the immediate vicinity. Moreover, if there happen to be any �paper� critters next to these �scissors�, the chain will continue, and do so yet again if there are more �rocks� near those. There�s no limit to how many times the sequence can repeat, so a single well-placed shot has the power to demolish hordes of nasties. As a final line of defense you�ve got a stock of five �time bombs� which will freeze the advancing army for a few moments � these handy items eventually regenerate, so don�t hesitate to use them when you need a moment to get back on your feet. Why Should I Play It? � Make no mistake, Finger Flashing is probably the most elaborate game of rock-paper-scissors (minus lizard and Spock, anyway) that you�ll ever play, and one crucial screw-up can sink you. The learning curve here is steep, since unlike most puzzlers you not only need to spot workable patterns quickly, but have several buttons to juggle � your hand-eye coordination will be taxed especially hard during the �boss� encounters at the end of each level, which disable your �time bombs�. Don�t freak out � take it slow at the start, adjust the control layout to your liking, get into a groove, and from there you can start tackling some of the tougher challenges (several of which are available from the start, without the need for unlocking). 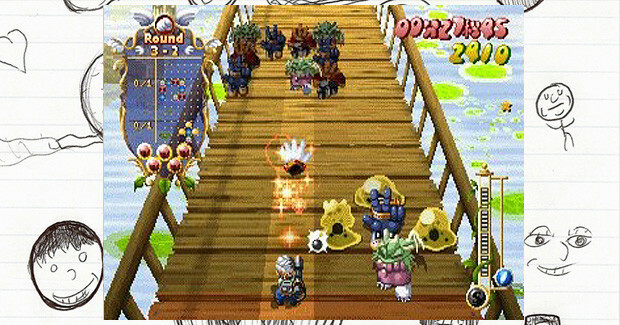 Once you reach that point the game will start throwing more and more monkey business your way, from obstacles in your path (some breakable, some not) to enemies that can jump over your shots or temporarily conceal their identities; their patterns also shift around a bit each time you play, so rote memorization can�t replace good old-fashioned ninja reflexes. If you�re hankering for a different sort of challenge, the basic Story mode isn�t the only way to ply your craft � feel free to push your twitch skills to the limit in Time Trial or pile on the points as fast as you can in Score Attack. Heck, if you can find someone else willing to give Finger a try, take him on in the Versus mode. Where Can I Find It? � Time to start scouring the import shops and auction sites again � Finger Flashing is another Japanese PS1 exclusive. While not exactly an �elite� acquisition, it�s definitely a rarer bird then most of its peers, and somewhat more expensive as well, so keep your eyes peeled � after you�ve tracked a copy down once you might not spot another for awhile. Anything Else? � Remember earlier in this series, when I said I was saving a few more �puzzle-shooter� recommendations for later? While these are certainly not clones of Finger Flashing, they play closer to it than to Calcolo, so here they are. Perhaps the best-known among these (relatively speaking) is Konami�s Quarth (aka Block Hole), which tasks you with shooting blocks at gap-ridden formations to fill in complete shapes (the recently-released Flame Tail has a similar vibe, though it draws more from Snake than shmups). More obscure possibilities include Dolucky no Puzzle Tour �94, Palamedes and Vermin Kids � Guru Logic Champ adds a Picross twist. If you�re willing to go out on a limb a little bit more, Zoop might also fit the bill. Well, that should take care of your �free elective� course requirement; I hope you all enjoyed this little break from the usual song and dance. Next week we�re back to something a bit more traditional�but at the same time branching out in a new direction yet again. Want to find out what I mean? Make sure your butts are back in these seats seven days from now � it�s as simple as that. Until then, class is dismissed! Thanks kindly for paying my blog a visit. I'm currently looking for paid writing gigs, so if you might want anything written shoot me a message (craighats at hotmail dot com). In case the contents of this blog don't make it obvious enough, I have something of an affinity for slightly "offbeat" titles, so if there's something out there that few others cover, there's a fair chance I'm at least somewhat up on it. If there's any sort of (reasonable) inquiry you'd like me to address, please don't hesitate to be in touch. Below are a handful of recaps and other links (oldest listed first by section), in case you're interested - asterisks mark promoted articles.